Final warning: These are RETROSPECTIVE reviews, so I will be discussing reveals, revolutions of cliffhangers, ends of plots, etc. If you are reading these reviews without having seen the eps, a) what is wrong with you?? Go watch them now! and b) these reviews are not for you till you’ve seen them. The first installment of Sherlock starts out with a bang. Literally. We begin by looking through a window into a nightmare of Dr John Watson’s, seeing him wake to a dreary life of PTSD until he runs into an old friend and thereby a new roommate, named Sherlock Holmes. Sherlockian nerds, ahem, scholars, immediately noticed in this very first episode that it begins nearly exactly the same way as in the original novel, A Study in Scarlet (also the very first Sherlock Holmes story way back in 1887). From Watson’s questionable bullet wound to him being invalided home from Afghanistan, to the fabled meeting with Sherlock at St Barts , things begin nearly verbatim in Mofftiss’ creation, showing what fanboys the creators are. 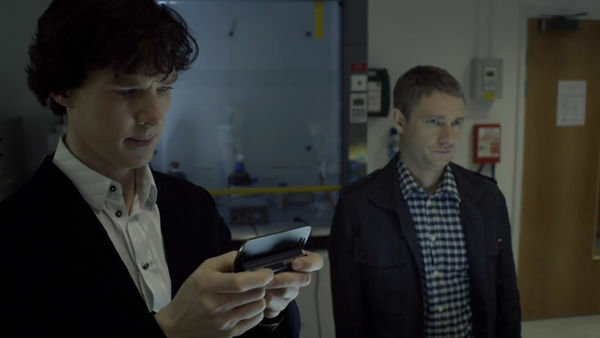 More echoes from the original ring throughout, including (but not limited to): Sherlock hitting dissecting subjects to measure post-mortem bruising, Watson having read an article/website of Sherlock’s called “The Science of Deduction” with much skepticism, Sherlock deducing a sibling’s life from the marks on a mobile phone (which is from the second, not the first, Doyle story, and it’s also a watch, not a phone, but hey), the word Rache scrawled in blood at the crime scene, to the major plot point of a cabbie with an aneurysm offering a choice of deadly and benign pills. All these make Sherlock authentic Sherlockian fare, as different a time period as it may be set in. But what sets this show apart from other adaptations, which we see immediately in this first episode, is its now-iconic style. 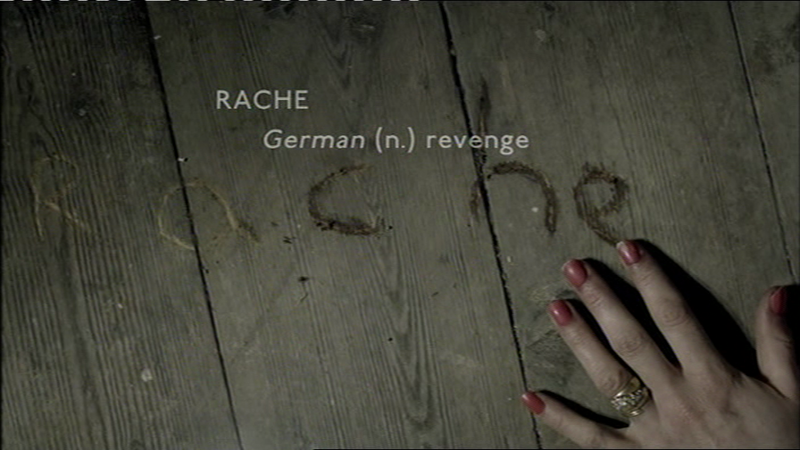 Before we meet Sherlock as a character, we meet the signature style in which his deductions are illustrated to us throughout the series: the appearance of text on screen. In the press release scene during which poor DI Lestrade and his sidekick sergeant Donovan attempt to placate the public in light of apparent serial suicides, we see the conglomeration of press people’s text messages floating right there on the screen. Shortly after, when we get to see Sherlock at a crime scene for the first time, we watch as he examines the body and surroundings, but instead of guessing what he’s finding, we see the words of his conclusions printed right in front of us. This is an artistic choice more in the vein of a visual art than a cinematic art. It’s not a surprise to learn that director Paul McGuigan began as a photographer. The use of line and framing, composition, and the stylized inclusion of text onscreen, as well as liberal use of actual stills throughout give this show much more of an artistic feel than what we’d find in a mere police procedural, even a very good one. This is what sets Sherlock apart more than anything else from its contemporary counterparts (I’m thinking Elementary in particular, as good as that show is)–the diligent nods to Doyle, and the intensely artistic eye. ‘A Study in Pink’ sets the stage for what the show will be with its character introduction, development, and a beginning of the Adventures of Sherlock Holmes very close to how the originals began, without intruding anachronisms in a Victorian setting, or alternately shoving stoic tradition into a modern setting. In this first episode, Mofftiss get it right. FINAL THOUGHT: One thing I absolutely love about this first episode (which has been a source of debate within Sherlockian ranks) is the character of Mycroft and especially his reveal. The sinister, omniscient, secret-service-type version of Mycroft is much more in the vein of Billy Wilder’s film The Private Life of Sherlock Holmes than the brief glimpses we get of him in the originals, but to make him a terrifying mystery, bandy about the name Moriarty, then reveal him as Mycroft with Sherlock’s reference to their Mummy is pure comedic gold. EASTER EGG: Did you also notice the foreshadowing of Mycroft’s line, “Can you imagine the Christmas dinners?” Watson’s response is “God, no,” but in “His Last Vow” we actually end up seeing one. Oh, and one more thing (to quote the second best detective in the universe): feel free to argue with me in the comments! I really loved the style of the earlier episodes. The later ones lost that. I agree. The third season is…frenetic, for lack of a better word. 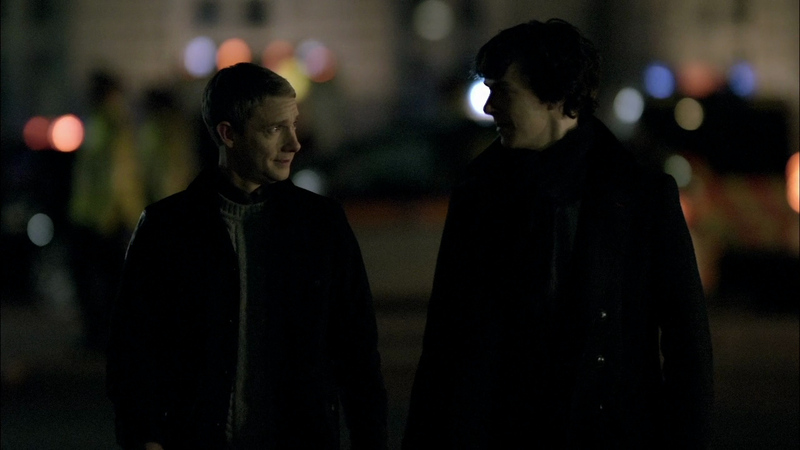 I came into ‘Sherlock’ after the second season had aired thanks to a recommendation from a dear friend. The greatest asset this show has is the genuine ‘fan-boys’ of Mark Gatiss and Steven Moffat. I honestly doubt that anyone else could have done such a marvelous job of modernizing Sherlock. My latest for Sherlock’s Home. I will be reviewing all 9 eps plus the short (plus the special that will be airing soon(ish).